Real time display of the lot state and of every statisical data. Every screen is completely customisable in order to adapt it to the customer needs. Graphic display of the lot state (pie charts, Gaussian distributions, points charts). Connection with up to 5 independent approved scales, which allows control in the same weighing system of every weight zone forecasted by the law. Simultaneous control management (production lines): It's possible to manage up to 10 products simultaneously. 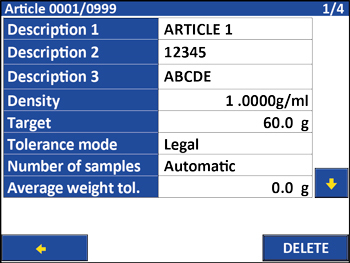 Weight or volume (ml) check through the insertion of a specific gravity for every article. Manual or automatic presettable (automatic or calculated) auto-weighed tare; automatic annulment function of the tare at the end of the weighing operation. Selection of the data displayed on the LCD graphic display (totals, progressives, weights...). 15 identification texts/configurable and printable attributes, everyone with up to 16 types, for example: Code, lot ID, operator ID, turn number. 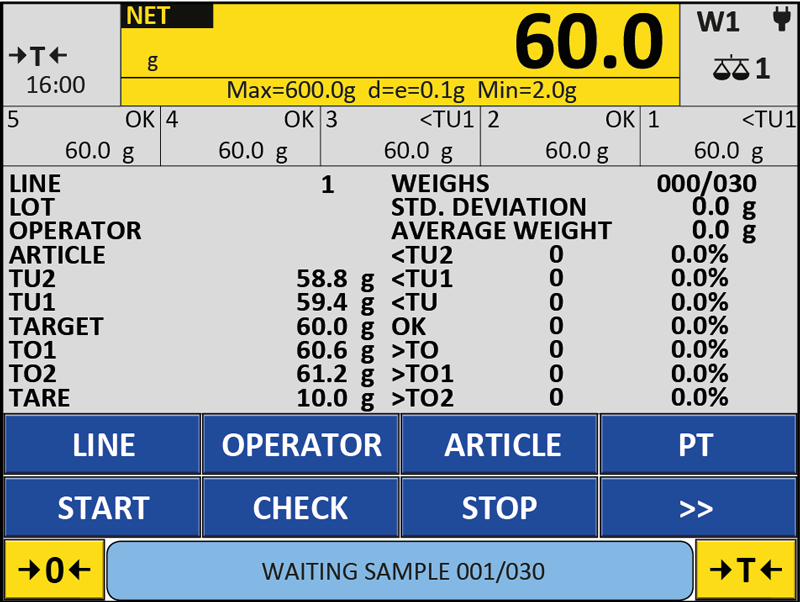 1000 articles database with 3 alphanumeric descriptions ,with a maximum of 20 types each, specific density, target weight, tolerance threshold (TU1, TU2, TO1, TO2), associated tare and needed check type, customising the function mode of the scale depending on the article. 100 operators database with 3 alphanumeric descriptions with a maximum of 20 types each. PC program that allows easy compilation of the scale database, with the option of an Excel format import/export. Configuration simplicity: in few minutes it's possible to program and transmit dozens of articles, keeping them into the memory. 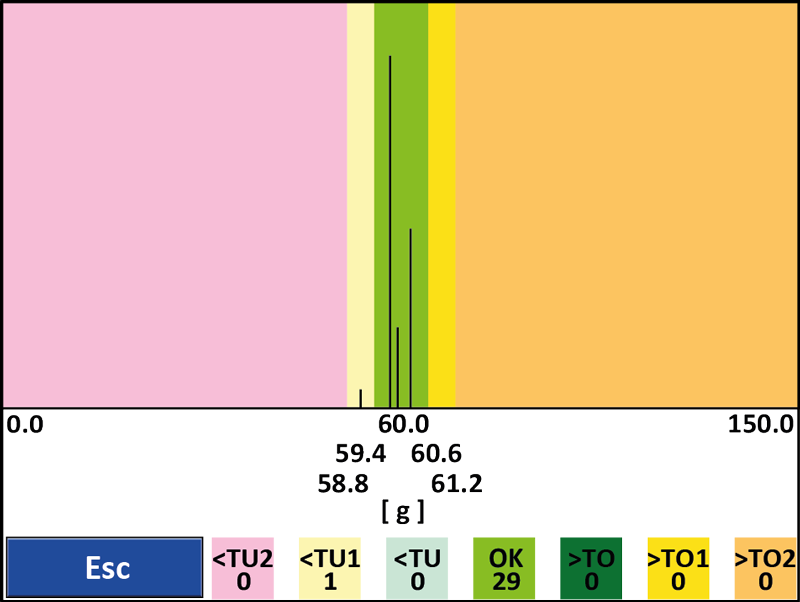 Cordinated programming of scales network databases, through an Ethernet-WiFi connection (TCP-IP). Security: it's possible to insert a security password for the protection of inserted data and avoid accidental modifications. Customisation: it's possible to insert a personal logo and translate the user interface directly in any language (file .ini). Specific software for production checking which includes all the main check functions, either in sample statistic mode or in complete statistic mode (as provided for by the directive N. 76/211/EEC). The touch screen interface shows in real time, every statistical data field with a chart or a numerical form. The simultaneous production lines check function allows up to 10 contemporaneous different articles check. CE-M approvable (OIML R-76 / EN 45501). Functioning mode that provides the weighing and the check of a certain number of samples depending on the quantity of packages that constitute the production lot. - automatically calculated according to legal regualtions. - selected by the user, for specific applications. - selected by the user, for more restrictive checks or internal use checks. Function mode that provides the weighing and the check of all the packages of the production lot. - manually if you set the illimitate integral check, for production with more than 10000 packages. - set by the user for more restrictive checks or internal use checks. 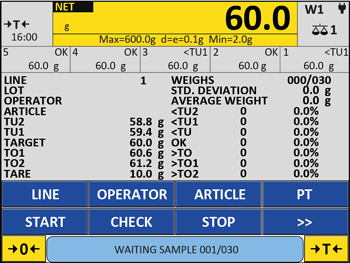 Function mode that allows the checking of the net weight calculated as the difference between full and empty packages (or vice-versa). This mode provides the weighing and the check of a certain number of full packages, weighed in a certain order, and consequently the related empty packages, weighed in the same order (or vice-versa). The number of samples changes in with the quantity of packages that constitute the production lot. - set by the user for specific applications. Quality control cycle of tares based on law criteria. The scale requires to weigh a certain number of tares, of which it verifies the tolerance over the nominal value, the standard deviation and the dispersion. If the tares satisfy these requirements, it's possible to proceed with the check of the prepackaged goods by using the tare medium value calculated during the tare check. The functionality here is available from the software version 06.00.00.